We are right upon the New Year and with that comes the resolutions. You need only walk into a gym or fitness center and you will know what many people have added to their list of resolutions…to lose weight. And if you are a member of a gym, you will notice that first week of the year surge in people coming into work out and in less than a month, the gym traffic returns to normal with many returning to their previous lifestyle. So, what separates the people have are successful at losing weight from the ones that quickly return to old habits? Those that make a plan and layout their path for being successful. With the high stress, fast paced lives that most of us lead, it is hard to wing it and actually accomplish the goals we set for ourselves. Planners are the key to creating a road to success. Your options for planners are numerous. Are you an electronic person? You like everything online, accessible on your mobile device or desktop? Do you like printable planners? 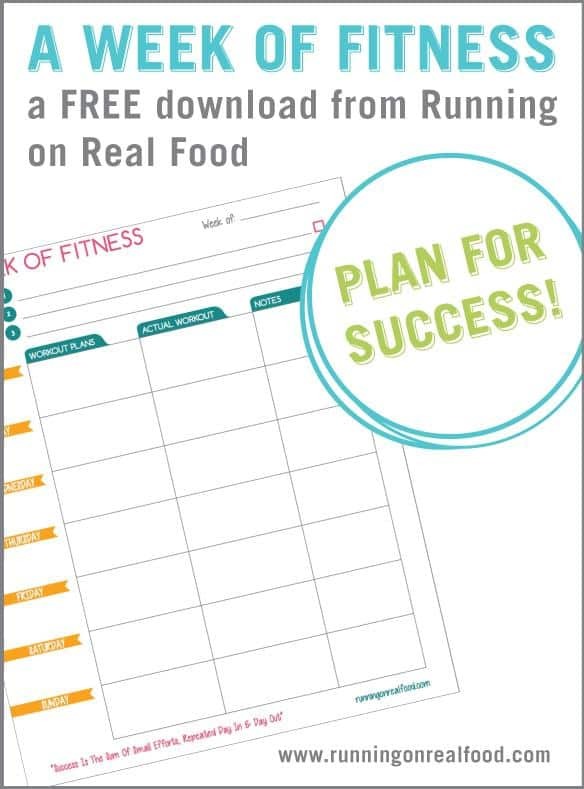 You simply print these sheets out and fill in the blanks creating a plan that will have you being healthier or more productive within a short time. The third option that is really popular is a bullet journal. Bullet journals are defined as a customizable and forgiving organization system. It can be your to-do list, sketchbook, notebook, and diary, but most likely, it will be all of the above. It will teach you to do more with less. Identify your fitness goals and priorities, then figure out the action steps for breaking them down into a list of manageable tasks. Be able to look at your month at a glance, so that you can look at the bigger picture and manage it realistically. Be able to track your daily intake of water, nutrients and exercise. Be able to meal plan and prepare a shopping list from the meal plan. Knowing what you are going to eat is key to being able to stay on track. Become more purposeful with your fitness journey by eliminating overwhelm, getting all those details out of your head and into one place. Reflect on what’s working and what’s not at the end of every month so you know if you need to make any changes to your fitness plan. A fitness planner should serve several purposes. It is important that you can see the big plan as well as look at what you are going to do tomorrow. You also want to be able to plan for fitness, healthy eating and emotional well being. With that said here are 12 free health planners that offer a variety of ways to plan for successful weight loss (if that is your goal) and fitness. Totally the Bomb Offers this free health and fitness planner that allows you to track water consumption as well as soda consumption with a plan for increasing water intake as you decrease the amount of soda you drink. 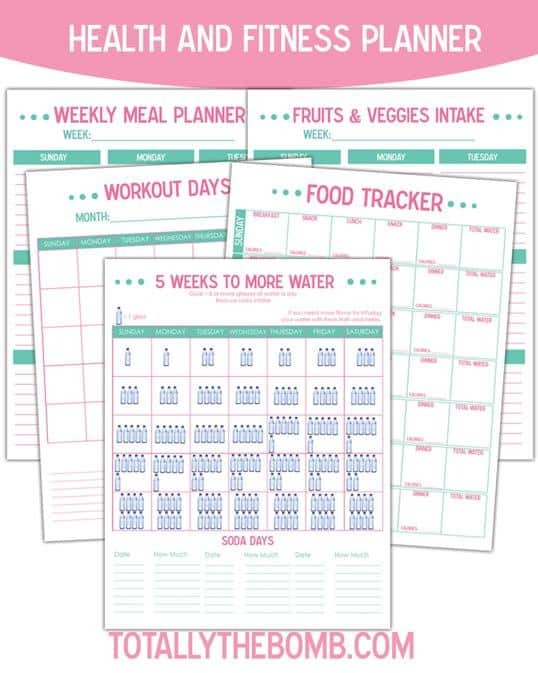 There is a sheet for planning exercise for a month, a food tracker for a month, a sheet for tracking veggies as well as a weekly meal planner. 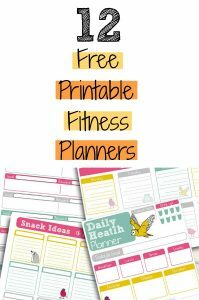 This printable fitness planner provides everything necessary to plan for health and fitness on a monthly basis. Health and Fitness Planner via Thirty Handmade Days. Thirty handmade days offers a selection of detailed daily food trackers. 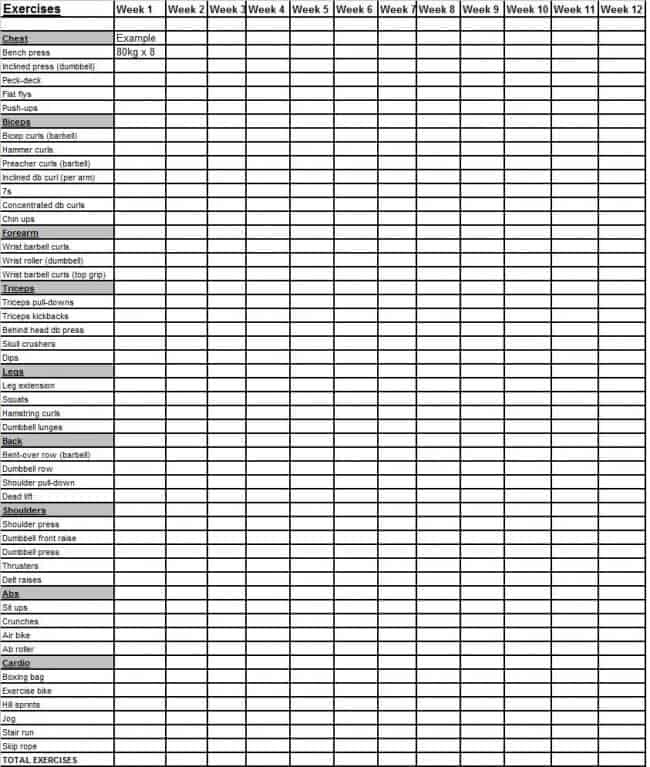 Whether you choose to track calories, points, carbs or simply get an overview of what you are eating, there is a printable sheet for you. Use the sheet alone or as part of a “bigger picture” plan. Exercise Printable via Learn Create Love. 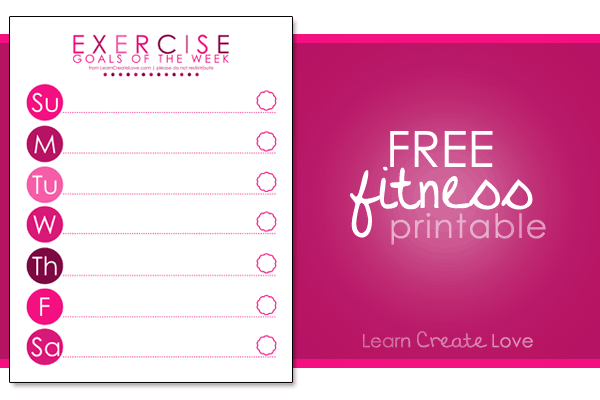 Learn Create Love offers this great exercise printable that is prefect for tracking exercise as well as planning exercise. If you are thinking about starting an exercise program or changing up the one you already have, this simple printable will keep you on track. 12 Week Exercise Planner via Cross Training Tips. This detailed fitness tracker is a great way to track strength training. It allows you to track weight and reps. It is a great tool for tracking progress as you feel your strength and muscle tone improve from week to week. Daily Food Log via SheKnows. 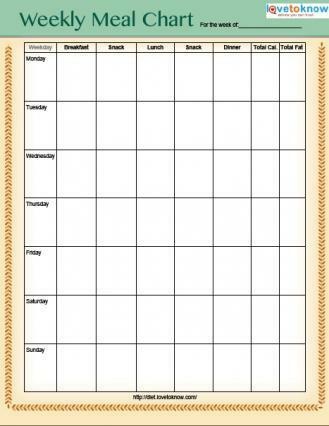 This daily food log is a printable that gives you a week to log all meals along with snacks. In addition to logging daily food intake, there is space for calories, carbs and fat grams. Food Diary via Dairy Council of California. 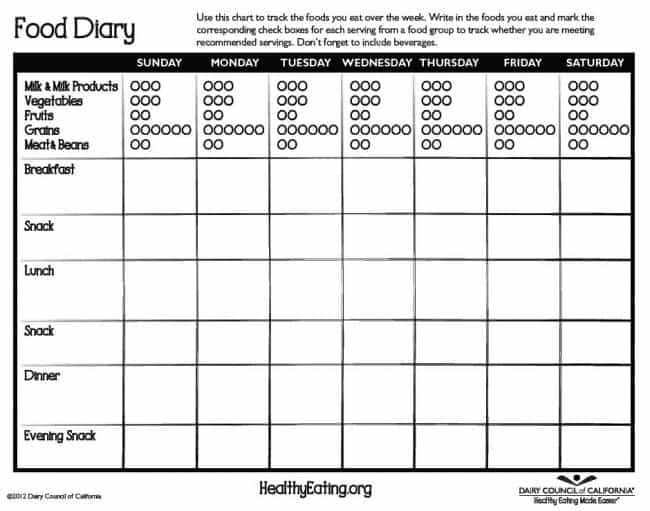 This simple single page chart provides a quick and easy way to track your food and liquid intake for the week. Get started today and keep your health on track. Fitness Tracker Printable via Hairspray and Highheels. 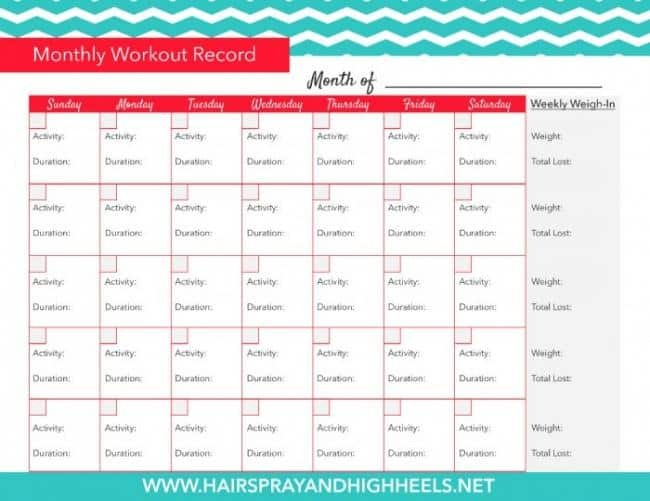 This monthly tracker is a great way to track your progress over the month as you set goals for fitness activities. The best part is seeing where you started the month and what goals you have achieved over the last 30 days. Weekly Progress Tracker via Pieces in Progress. This is an awesome tracker where cardio and strength training reps and hold time can be recorded. You can see where you have progress from one month to the next. Weekly Meal Chart via Love to Know. 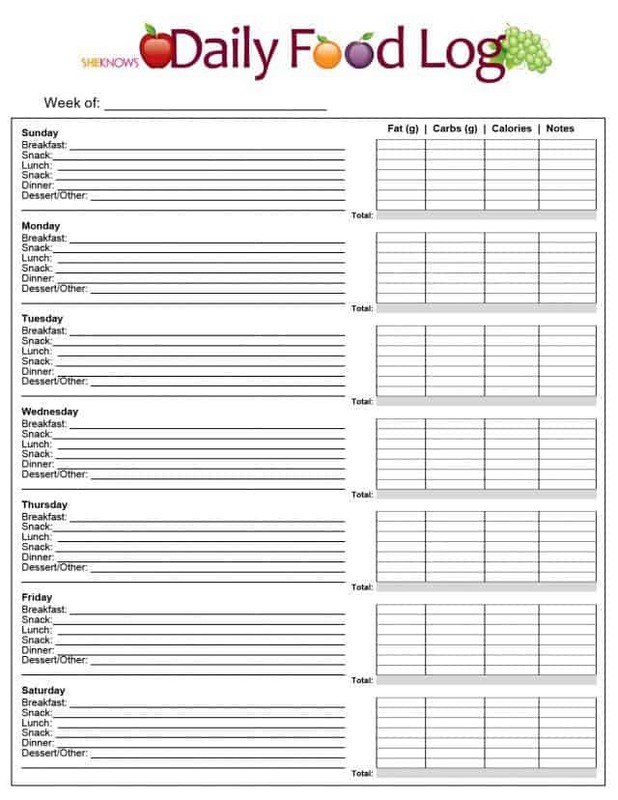 Whether you are trying to lose weight or not, a weekly meal chart is the perfect tool for staying organized with nutrition, staying on a budget and creating a shopping list. Weekly Food Journal via A Sunshiny Day. 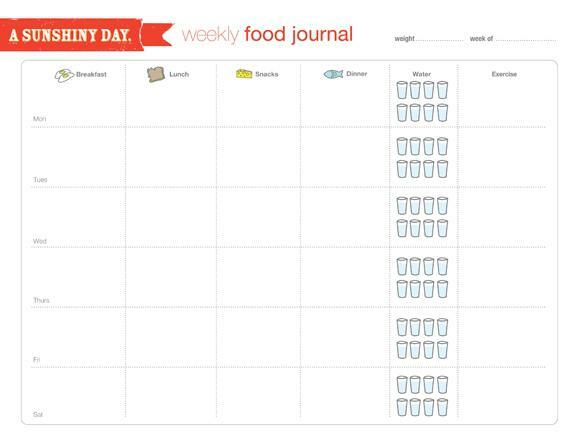 This simple journal page is the perfect way to track your daily food intake. Print out a stack of these sheets and meet your nutrition goals and daily water intake with this handy track. Free Printable Workout Planner via A Sunshiny Day. The best way to stick to a goal is with a plan. 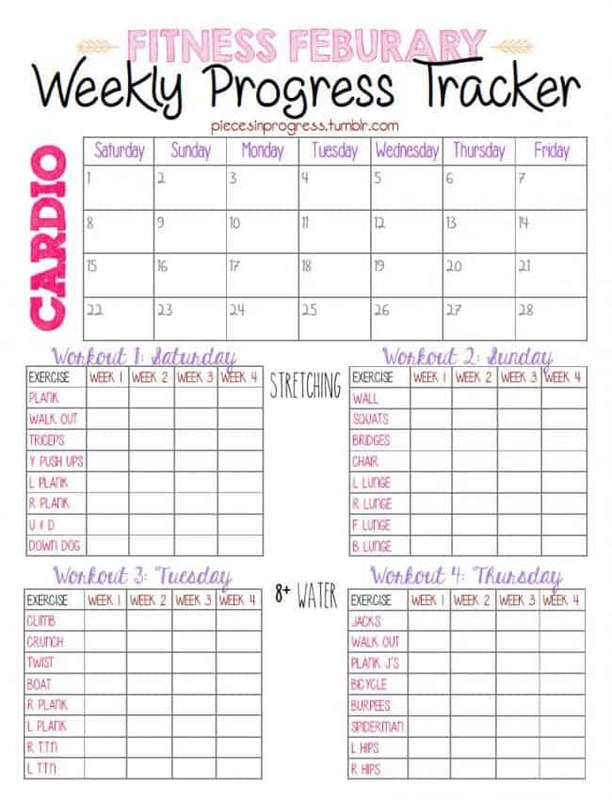 The free printable workout planner can have you on track to reach your goals in no time at all! 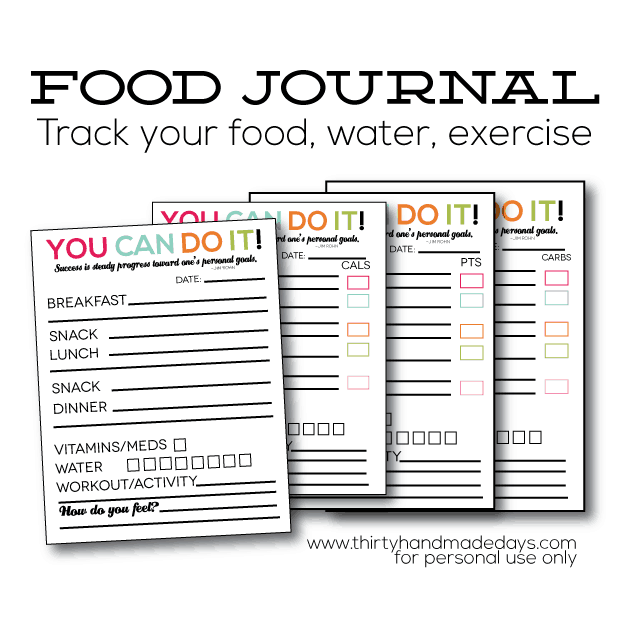 Printable Food Journal via Happiness is Homemade. 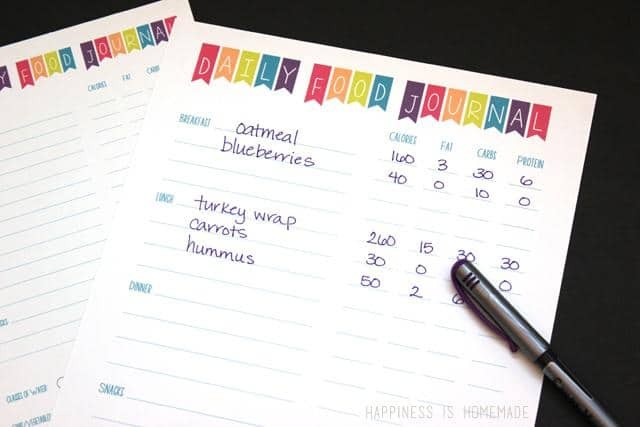 This 2-size journal offered by Happiness is Homemade provides an easy to follow daily food journal that tracks your calories, fat, carbs, protein for each food you eaten. So you can keep a journal of your food intake and cross-reference it with your goals and recommended daily food intakes! Planners, whether they are single printable page, an online tool or a journal with many pages, have to fit your personality. If you are a person that likes detail, you can most likely handle the multiple page A – Z layouts. If you become easily overwhelmed, you may be better off with a one page summary. Some people live their life off their mobile device. In that case, an app may be what you need. You get the idea. Find what works for you and leave the rest for someone else…good luck!